Summer glorious summer, so happy you are here! Go out and enjoy some sunshine but before you do, check out this colorful image collected over the French Open on June 10, 2017 at 13:25 local time. Held each year in late May to early June at the historic Stade Roland Garros in Paris, the French Open is the second tennis Grand Slam of the season. The only Grand Slam played on clay courts, the recent editions of the tournament have been dominated by Rafael Nadal on the Men’s side – winning his 10th title in 2017; and then Jeļena Ostapenko won her first Gland Slam title in 2017 on the women’s side. According to 2017 TV schedules, Ostapenko would have been scheduled to play in the Women’s Final on June 10th. 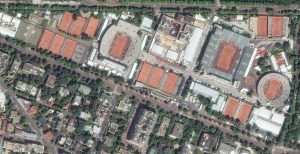 This entry was posted in The Geospatial Times and tagged france, French Open, monthly spotlight, The Geospatial Times, Your Imagery Work Break by Apollo Mapping. Bookmark the permalink.